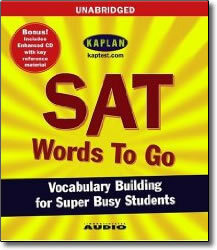 SAT Words To Go on CD allows busy students to study anytime, anywhere! Guaranteed to make learning SAT vocabulary words quick, easy, and fun, SAT Words To Go is conveniently designed to allow you to master words found on the New SAT while you’re on the run. Kaplan, the world leader in test prep, provides a full range of services, including test prep courses, admissions counseling, programs for international students, and more.